Typically eight errors in a game spells disaster, yet the Class A No. 4 Yellow Jackets rose above the blunders for a 5-4 win against Class AA No. 6 Petersburg at George Hott Field on Thursday. 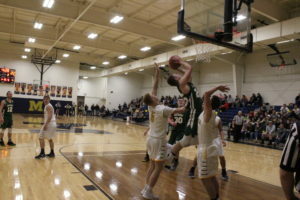 There has been a sense of resiliency building throughout the season for Moorefield (11-5) and working to overcome mistakes has created positive outcomes as seen against the Vikings (10-5). 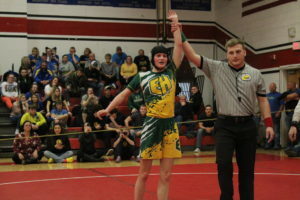 “This is attributed to two really good pitching performances by Hayden [Baldwin] and [Derek] Hoyt. 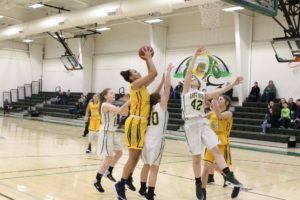 Those guys hold their composure,” Moorefield skipper Wade Armentrout commented. The Moorefield Little League was recognized as team members joined the players on the field for the national anthem. The Yellow Jackets started the game without any issues as pitcher Hayden Baldwin struck out Petersburg leadoff batter Peyton Sindledecker, then Tyce Wisnewski grounded out to shortstop Isaac Van Meter with throw to Blake Watts and Trad Harman flew out to left fielder Derek Hoyt. Petersburg pitcher Tanner Champ issued walks to Moorefield’s Brent Moran and Garett Haggerty before recording a strikeout to Watts. Jake Ours was hit by a pitch as the dugout told him not to rub it and the bases were loaded for the Yellow Jackets. Moran was forced to dive back to third base as Petersburg catcher Lucas Berg attempted a pickoff, then a passed ball created time for Moran to score for the initial Moorefield advantage. A free pass was given to Baldwin which loaded the bases again, then Van Meter connected for an RBI single up the middle to boost the lead to 2-nil as Haggerty came home and Caden Kimble came in as the runner. 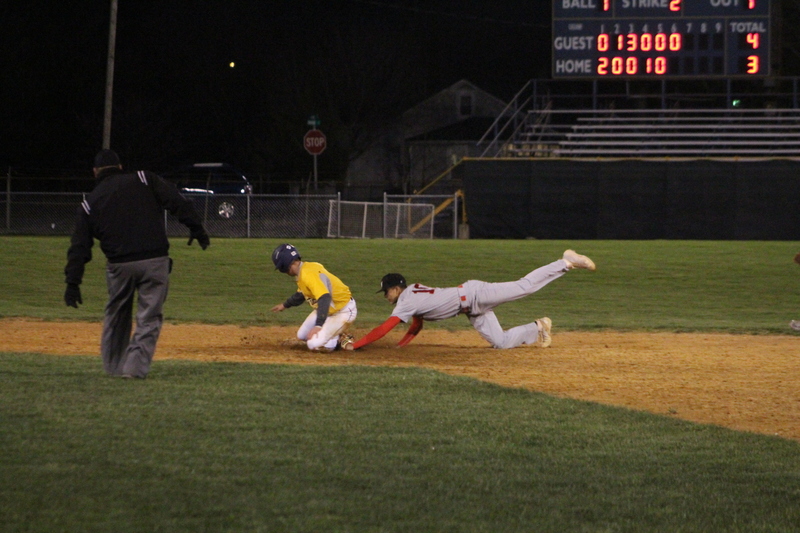 An errant pickoff throw eluded Petersburg third baseman Tyce Wisnewski doing the splits as the ball went underneath and Ours stretched under the empty the glove to reach the bag, then Wisnewski fell on top preventing a chance to immediately get up. Moorefield’s Lane Ours struck out looking and Hoyt grounded out to Vikings shortstop Cameron Masih to keep the lead at 2-0. In the top of the second inning, Petersburg’s Hunter Pool reached on an error as Moorefield third baseman Brent Moran’s throw eluded Watts at first base. Baldwin notched a strikeout to Chase Ault, then Jacob Hartman hit into a fielder’s choice and the throw by second baseman Garett Haggerty went out of play. Lucas Berg launched a shot into left field and it was dropped by Hoyt as the Vikings now had runners on the corners. A passed ball was retrieved by Moorefield catcher Lane Ours, but the throw missed Baldwin’s glove as Hartman scored to make it 2-1 before the side ended on a groundout collected by Van Meter.